Happy Thirsty Thursday from Cousin Christy! Today, we will be relaxing with a drink I like to call “The Rosie”. Now this might sound unconventional, but for my birthday this year, I asked my friends to get me tea! One of the teas I received from my best friend was David’s Tea’s Ruby Red. Though it may be summer seasonal. If you cannot find this tea anymore, the juice of half a grapefruit makes a delicious substitute! Now, this tea on it’s own, being a grapefruit-y blend, is both a little sweet and a little sour. When thinking of a name for this devious cocktail, I instantly thought of a certain Min Pin I know who is a little sweet and a little (on a nice day) sour. Her name is Rosie! Though she may look sweet and innocent at first, she has a little bite to her! She is the queen of her house and it’s best not to get in her way. So in honor of her Majesty, I thought I would name this cocktail after her and maybe she won’t nip my heals when I come to visit anymore! So you have your ruby red tea steeped now. Oh did you miss the part where I told you to do that? No turning back now! Steep the tea in hot water for 4-7 minutes depending on how much zingy goodness you desire. The gin and elderflower liquor balance each other so well in this cocktail. However, that does in no way mean you add equal parts! Elderflower liquor is quite sweet so it will be to taste, but start out with a little at first. Gin is one of my favorite hard liquors and Hendrick’s is at the top of my gin list. Hendrick’s gin is also great for “The Rosie” since it is actually made with rose petals! Of course if you’re not one to splurge on gin or have different tastes than me, certainly go with a gin of your choice or get one of those single ounce bottles of gin that you think are so cute. C’mon. It’s so small. Is a leprechaun trying to get drunk? As for the Elderflower liquor, St. Elder is the only brand I am familiar with. If you’ve tried others you like, please comment below as to what brand you used and if it goes well in this cocktail! Look at that. She just knows she’s the queen. Steep tea in hot water for 4-7 minutes. See Sister Yaya’s blog on tea to find out more specifics on temperature of the water! Wait for tea to cool or over compensate with amount when you pour over ice. Add 1 ounce of Hendrick’s gin. 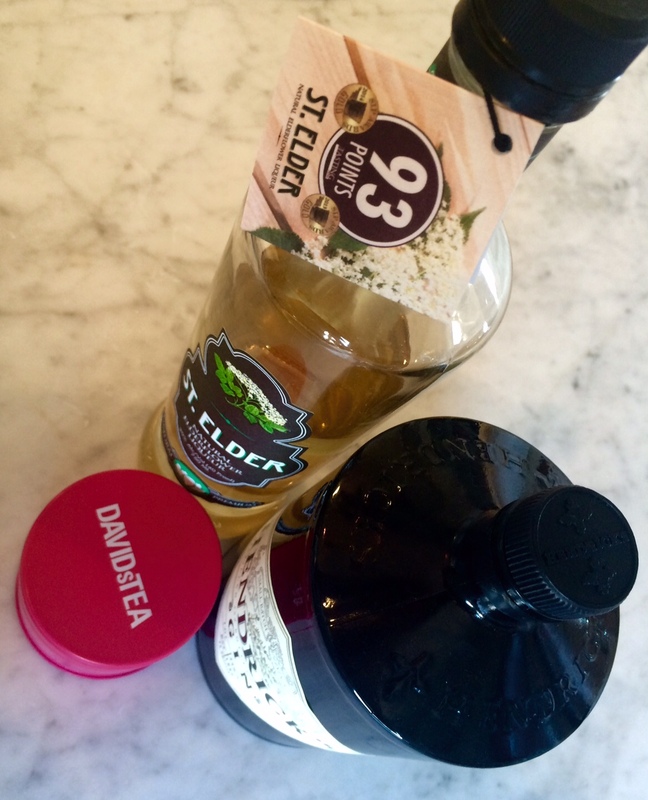 Add a dash of Elderflower liquor to taste. I bet if Rosie were to try this cocktail, it would be the only tail she’d keep chasing! *This tea is seasonal and might not be widely available until next spring or summer. It sounds deeeelishous and I look forward to sipping one with you while Rosie, the queen, lounges on my lap! This sounds yummy and Rosie sure is a cutie!